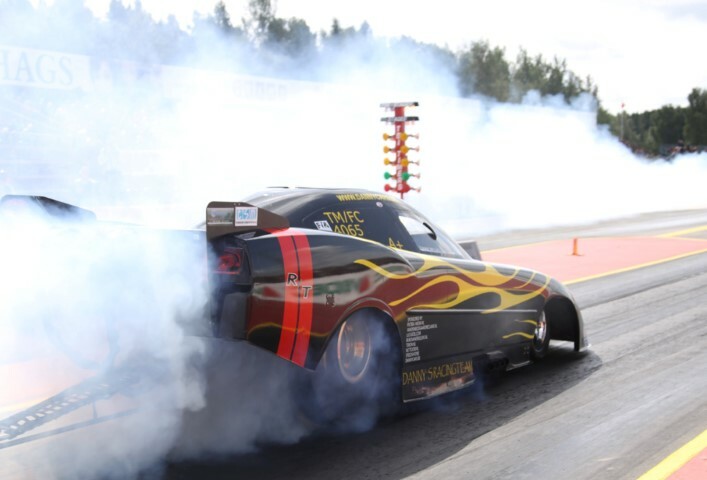 The 3rd FIA round of the European Championship was in Mantorp Park Sweden. Like every season we are looking forward to experience the great atmosphere again at the Veidec Festival. The team arrived on Wednesday and prepared the Funny Car on Thursday. On Friday in the first qualifying session we hit tire shake badly. Danny got of the throttle and cruised down to the finish line. The next run of the day, left lane this time, was much better. A nice 5,88 sec. and the highest speed: 391,88 km/h. Saturday in the 3rd qualifying round things went wrong. Danny made a great burn out and staged in the right lane. Almost immediately after the start line the right front wheel collapsed and the car went to the right side. Danny hit the wall hard and ran along the guardrail all the way to about 900 feet, where the car stopped and had to be town away. Danny was OK, butthe car suffered severe damage. After the Funny car and body were brought to our pit, we found out what caused the crash. It seemed that the spindle of the front wheel broke and so steering was out of the question. A spindle shouldn't brake like that as long as you don't do a wheel stander! At first we thought that the race was over for us, but after a few hours of searching we found the necessary spare parts. We finally could start rebuilding the car with the help of other TMFC-teams. We worked till late at night and made the car and the body ready for the eliminations on Sunday. As we were 4th qualifier we had to meet the number 3 qualifier, Jarmo Kuutniemi. Danny had a stunning reaction time of 0,0089 but hit tire shake again, went of his line and couldn't catch up with Jarmo anymore. This was a weekend we would like to forget as soon as possible. We go home with a car and a body that needs repairing and a lot of work before the next round at Hockenheim. We would like to thank the safety crew of Mantorp Park and all the people who helped us with getting the car ready to race on Sunday. Special thanks go to Dan Larson and his team for prepping the body and a lot of welding works. Also a lot of thanks to Ulf Leanders and team for lending us a wheel and tubing.